The Member's Mark Mobile Office provides the perfect luggage solution for the business traveler. 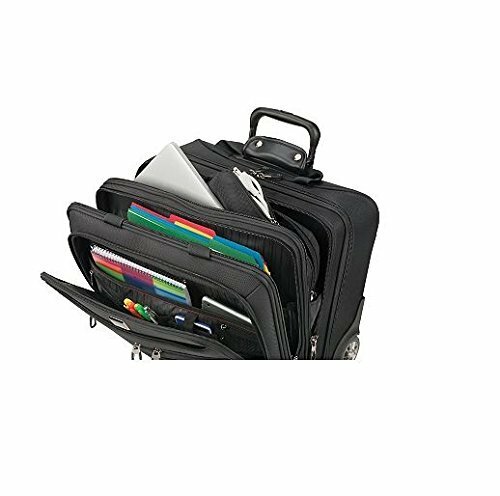 This rolling briefcase is made from rugged ballistic material, heavy-duty construction, and quality zippers with self-repairing teeth. Ball-bearing wheels allow for easy gliding. Lightweight casings and high-grade polyurethane wheels create effortless mobility. A removable messenger bag fits up to a 15.4" laptop and includes a power cord case. Separate front pockets with dividers keeps files organized. Multiple quick-stash pockets all for easy access of frequently used items. A special pocket with cross-straps keeps clothing in place while traveling. Three large pouches hold toiletries and personal items. The bonus laptop messenger bag fits over the rolling bag handle for easy transport and provides extra room in the bag if needed. A bottom front handle allows for easy lifting into overhead compartments. A small wet umbrella pocket fits up to a 13" umbrella and has a small air vent to facilitate drying. If you have any questions about this product by Mobile Office, contact us by completing and submitting the form below. If you are looking for a specif part number, please include it with your message.